The Sleeping Beauty is one of the cornerstones of classical ballet. With luscious music by Tchaikovsky and exquisite and imperishable choreography by Marius Petipa, the ballet was first performed at the Mariinsky Theater in St. Petersburg in 1890. Even today, the ballet is a loved ornament in the repertoire of the Mariiinsky Ballet, or Kirov Ballet, remaining so through the company’s many transformations. It’s one of those ballets that any classically trained choreographer eventually revises, re-sets and re-presents. In 1990 Helgi Tommason, feeling the company was ready for the challenge, set the ballet for the San Francisco Ballet. And like the choreographers before and to this day, he based his setting on Petipa’s original. Things are changed, yes, but the basics are there. The Lilac Fairy still has sweeping extensions in her variation. Aurora dances her first act variation with the same delicate piqué steps. The Bluebird does mind-boggling beats. Etc. Etc. Why fix what ain’t broke? Petipa’s choreography is quintessential classical ballet: highly virtuosic and demanding of both dancers’ technique and musicality. This year, the company is presenting Tomasson’s reworking of Petipa’s The Sleeping Beauty as Program 4 of the season. 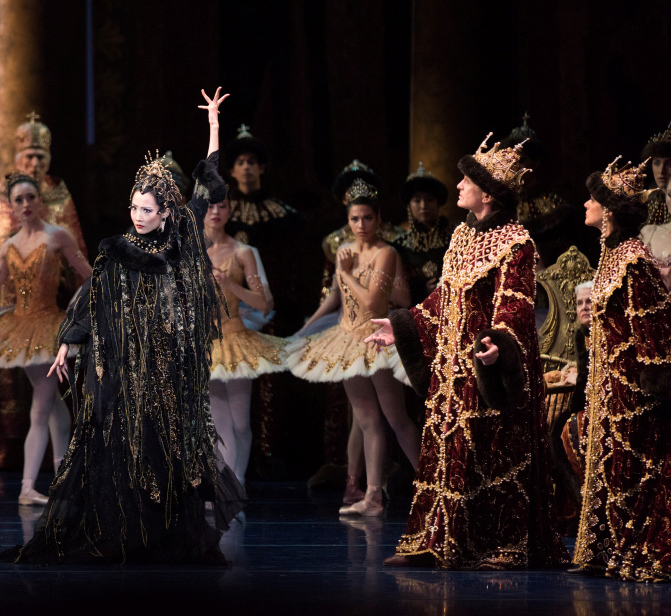 The wicked Fairy of Darkness confronts the royal parents to curse their baby in San Francisco Ballet’s “The Sleeping Beauty.” Photo by Erik Tomasson. The San Francisco Ballet version is placed in 16th and 17th century Russia. The young Princess Aurora who pricks her finger and falls asleep for a hundred years grows up in medieval Russia, in a world of Byzantine opulence, with the court dressed in long red brocade kaftans trimmed with fur and matching fur-trimmed hats. When she is awakened by Prince Desiré’s kiss, Russian fashion has given over to Europe, and the celebration of their wedding takes place in French haute couture of the court of Louis XIV, with silky white wigs the finishing touch. The gorgeously stylish court garb and sets were designed by Jens-Jacob Worsaae. That, however, is only the court, the velvet setting for the precious gems of dancers. Tutus abound, decorating the Princess Aurora, the Lilac Fairy and the fairies who bless her at her christening and the story-book characters of her Act 2 wedding. Tunics and tights splendidly display the long lines and musculature of her Prince and the ballerina’s partners. Because, after all, this is ballet. Opening night saw Sasha De Sola as Princess Aurora, and she was lovely. Technically strong and a vibrant dancer, De Sola was dancing exceptionally well in the first act, portraying the princess in all her youthful exuberance. Dressed in a tutu splashed with peach and rose brocade and crowned with pearls, she negotiated the Rose Adagio with aplomb. One of the absolute necessities of Petipa’s choreography is balance, holding a pose on one pointe with the lifted leg in attitude or arabesque, staying there for just one or two seconds longer that seemingly possible. It takes heaps of strength. And De Sola, with her highly arched feet, always manages to step, dance, and suspend herself far over on the pointe of the shoe, and then hang there. In the second act, where Prince Desiré is shown a vision of Aurora by the Lilac Fairy, De Sola projected an emotionally subtle dream-like quality. And in the Wedding she enveloped the character in a grander more mature presence. Carlo Di Lanno was Prince Desiré, a role he seems completely happy in and one which he delivers with a range of emotions from haughty and disaffected to entranced and adoring. He too has admirable classical technique, executed with grace and ease. Other highlights were Jennifer Stahl as the Lilac Fairy, and Wanting Zhao as the evil Fairy of Darkness, who curses the newborn baby after not being invited to the party. Elizabeth Powell and Sean Orza danced the White Cat and Puss-in-Boots, which must be everyone’s favorite cat video, the two of them slinkily rubbing against each other and then trying to scratch each other’s eyes out. Lonnie Weeks danced the Bluebird and Koto Ishihara danced the Enchanted Princess in yet another impossibly difficult variation. And then there were the hundred thousand other roles of court and glade that were danced by the corps and members of the San Francisco Ballet school. If you love enchantment, a fairy tale of courtly grandeur, and an evening watching exquisite dance, this is the program for you: San Francisco Ballet’s The Sleeping Beauty. Continuing through March 17. For information and tickets, visit sfballet.org.